Bull Terriers will normally live for ten years, but given heaps of attention and the right foods it can live up to 13 years of age. The healthy male of this breed should be 22kg and 38cm tall, while the female should be 16kg and 30cm tall. A Bull Terrier can be wonderful with children if handled with common sense. It will tolerate a large range of children’s behaviour, but will not tolerate being teased and can be rough if constantly provoked. 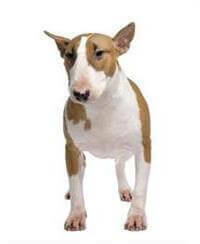 Owning a Bull Terrier is a big responsibility and the breed only deserves responsible and caring owners.